Our meetup has been set – we’re meeting at the desi-owned Redwood Bar and Grill at 7PM on Saturday March 1st. It’s downtown, across the street from a metro station and it’s … pirate themed. I’ve heard left coasters talk a lot of smack about how the LA meetups are the biggest and best we ever hold, yadda yadda yadda. All I can say is: bring it. I’d love it if we could have the sort of turnout we saw in 2006, as in September 2006 and December 2006. Vinod, Taz and I will all be there, so there will be a lot of mutiny all in one room. I’m looking forward to meeting the best and brightest that the LA mutiny has to offer. This entry was posted in Meetups! by Ennis Singh Mutinywale. Bookmark the permalink. what’s a Tamil pirate’s favorite instrument? Fret not DC-ites. We’re meeting up on Sunday. Post coming soon, if you and I didn’t already discuss this at last night’s sublime Subcontinental Drift. 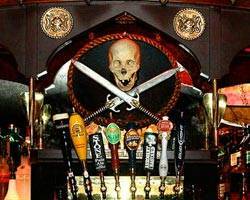 Cool, pirate bar. Will try to be there. I might show. right off the 101 I think. Can we have an NYC meetup soon? Pretty please? One of my bestest friends is coming to la la land from DC. I think I’ll be there, but it’ll be up to my homie. I got skooled. I’ll be there +1. Maybe I’ll bring a posse. Be there for sure; me plus one. I will be there. Plus one for sure. Maybe two. i’ll likley drop by for a bit, with 2-3 others. What happened to the plan to meet on the Westside? Many Angelenos would not be caught dead east of La Cienega. There was also a request for a meeting near public transit somewhere, and Redwood came strongly recommended. Also, not being an Angeleno, I had little sense of the geography. mark: expand the LA geography….